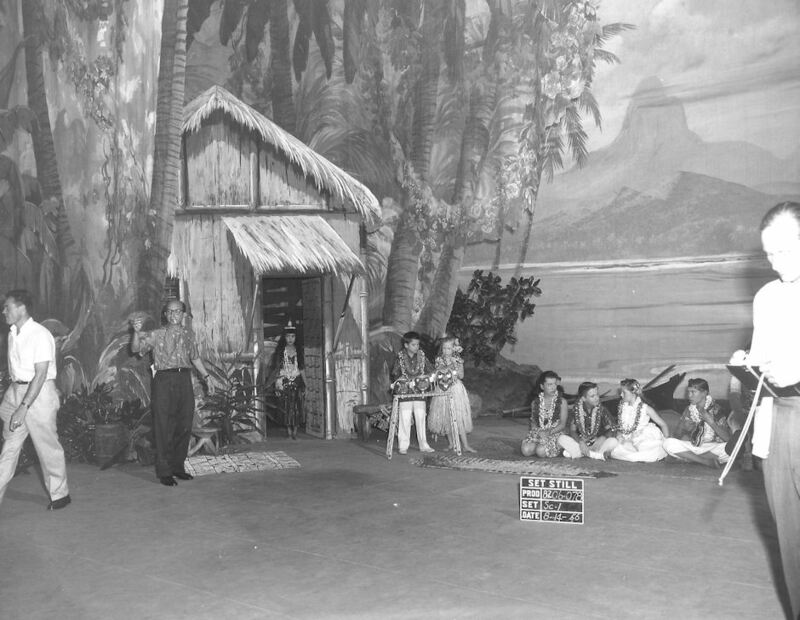 As with many second season FWM day skits Holiday in Hawaii starts off in what the clapper has labelled the "School Rm", also called the Mousekamusic Class. Jimmie Dodd seems unusually pensive, as if he had just had an unsettling epiphany. 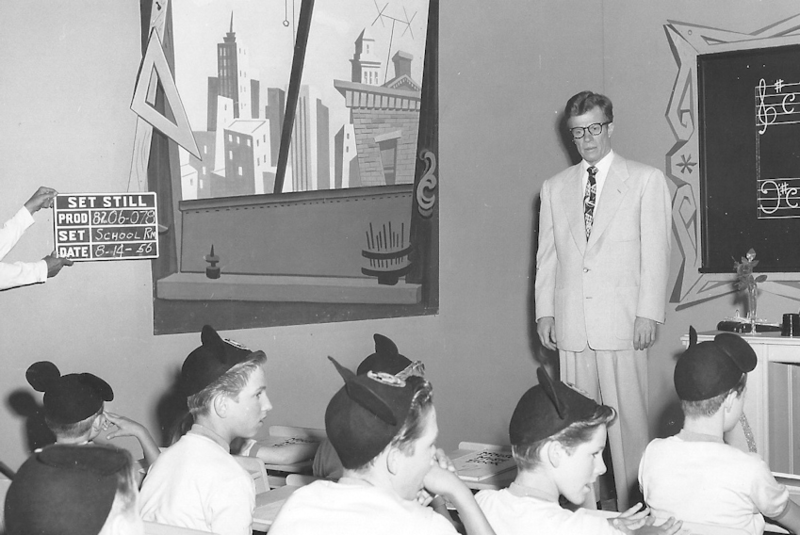 The skit was filmed August 14, 1956, and first broadcast December 10, 1956. The full picture reveals the catwalks above the corner walls of the set. On the teacher's desk, behind a row of apples, lies the ukelele that will form a focal point for the segue to the next scenes of the skit. 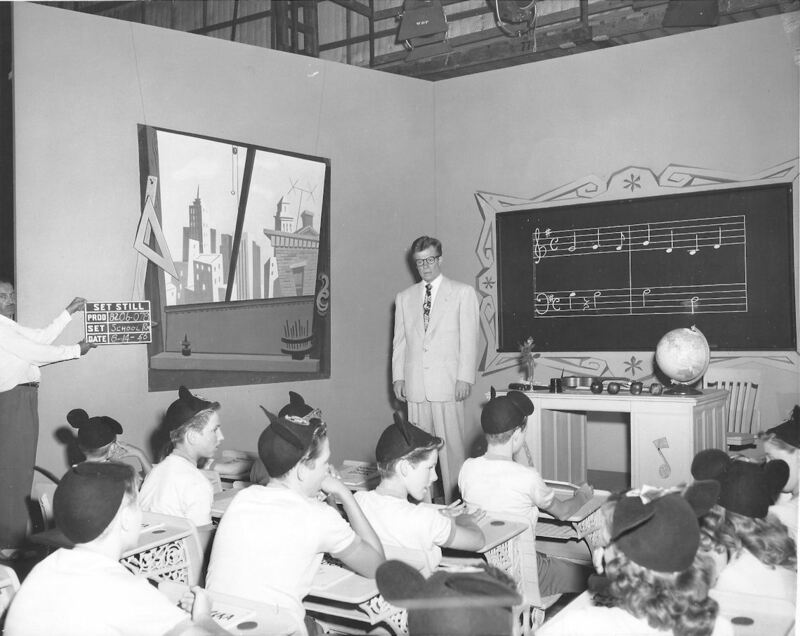 The advantage to using the Mousekamusic class set was that while some mice filmed the school room scenes, others could be rehearsing the actual musical numbers. Used often in the second season, it was abandoned in the third year, perhaps because the reduced number of mice would have made it seem a bit forlorn. 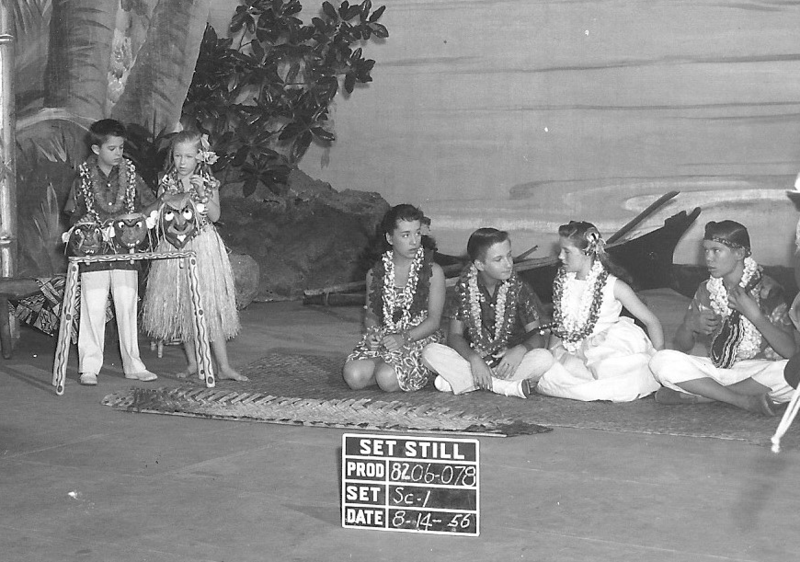 Cubby, Karen, Margene, Tommy, Darlene and Bobby wait for the director to start the filming. Notice how Margene and Bobby have been given makeup and hairstyling to suggest they are locals. Although the clapboard calls this scene 1, the exact order of filming on this day is problematic. The full picture above reveals director Sid Miller, cigarette in mouth, giving the set a final lookover, while in the doorway of the hut Sherry awaits her cue to begin a dance. Though the level of detail makes it hard to see, the crewman to the viewer's left also has a cigarette between the fingers of his left hand. This was Sherry's first appearence on a FWM day skit, and the character she plays ("Arloha") is not identified as her in the script (written by Larry Orenstein). It could be this role was intended for a guest star as was done a few times with other skits this season. The elaborate sets for this season's FWM skits would help make it the most expensive year for the show. For the third season a minimalist style was employed for most skits, with a few props and recycled cut-outs taking the place of wall-sized backdrops.